For all gasoline engines, including 2-Cycle. Use in your vehicles, outdoor power equipment, motorcycles and other small engine vehicles, etc. 1 ounce (30 milliliters) treats up to 5 gallons (19 liters) of fuel. Recommended for use at every fill up in Small Engine, and vehicles using Ethanol blended fuels. Product does not contain alcohol. Perfect for use in all gasoline cars, trucks, sport vehicles, lawnmowers and smaller. 360 Protection HELPS TAKE Protection OVER THE TOP. SMOOTH IDLE: Keep your engine free of corrosion and buildup, and keep it running without hesitation. Feel the difference from start to finish. HOW DOES STA-BIL 360° PROTECTION WORK? 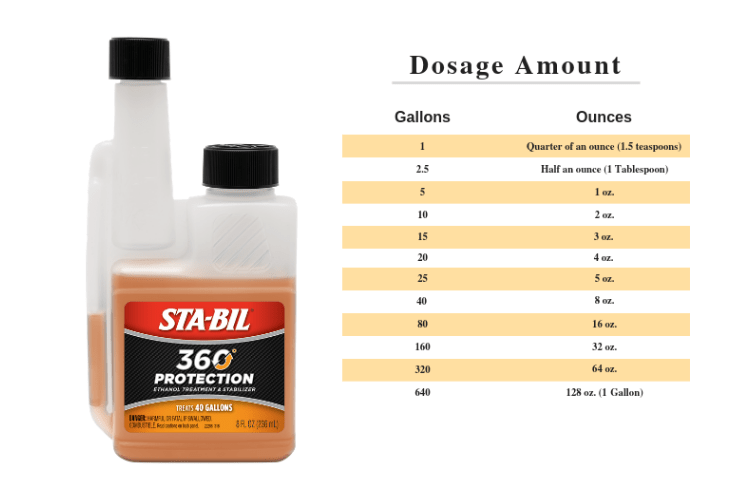 STA-BIL 360° PROTECTION offers comprehensive protection by releasing a microscopic corrosion preventing vapor inside the fuel system that coats ALL metals parts, including the fuel tank, fuel sending unit, valves, carburetor, fuel injectors and intake manifold. It’s like fogging oil for your entire fuel system, offering “360 degrees” of corrosion protection and is safe to use in all types of gasoline – from ethanol-free fuel to E85. HOW IS STA-BIL 360° PROTECTION DIFFERENT FROM THE OTHER STA-BIL BRANDED PRODUCTS? STA-BIL 360° PROTECTION accomplishes everything our current STA-BIL products offer, including keeping fuel fresh, removing water, cleaning the fuel system and more, but this revolutionary new product provides an exciting new level of protection for ultimate performance. For the first time, STA-BIL 360° delivers corrosion protection above and below the fuel line by releasing an innovative vapor that coats all metal parts within the fuel system to prevent corrosion. HOW OFTEN SHOULD I USE STA-BIL 360° PROTECTION? 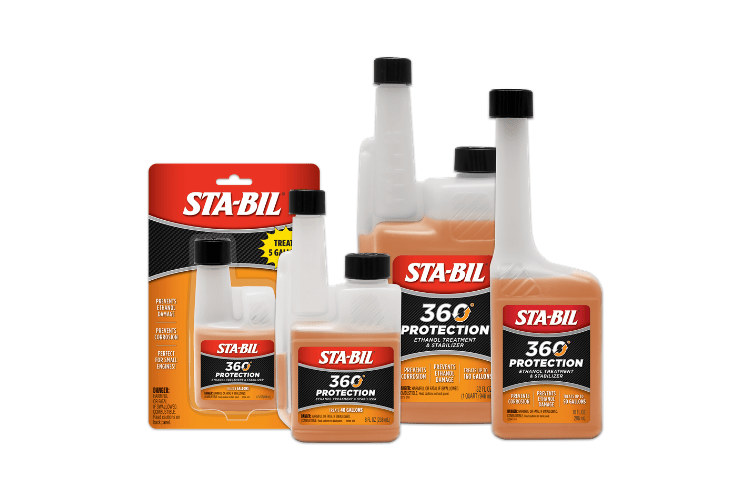 In vehicles you drive frequently, STA-BIL 360° PROTECTION should be used AT EVERY FILL UP for ultimate, year round protection against corrosion. If your vehicle is in storage, one use will stabilize the fuel for up to 12 months (if used when stored fuel is fresh). HOW LONG WILL THE VAPOR COATING IN STA-BIL 360° PROTECTION™ LAST ONCE I POUR IT INTO MY FUEL TANK? 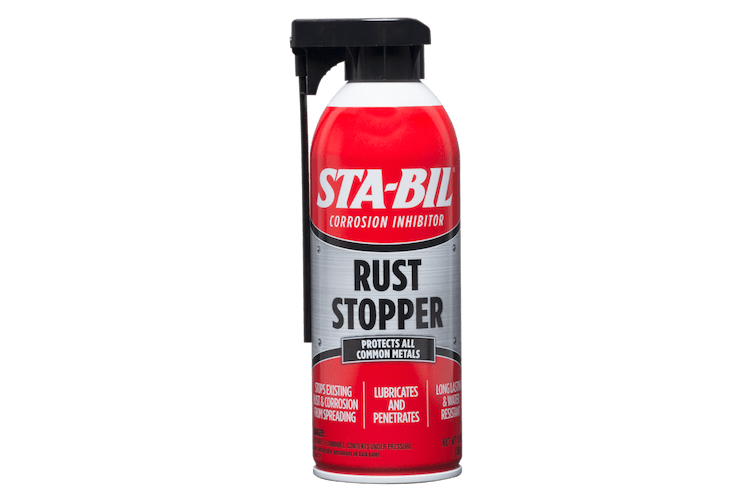 Once poured into a tank of fuel, STA-BIL 360° PROTECTION™ will provide a vaporized corrosion inhibitor coating for up to 12 months in a stored vehicle or equipment. However, once a tank of fuel is used up, and new fuel is poured into tank, it will be necessary to re-treat the fuel with 360° PROTECTION™. WHAT TYPES OF VEHICLES AND EQUIPMENT SHOULD I USE STA-BIL 360° PROTECTION™? STA-BIL 360° PROTECTION™ can be used in any gasoline engine, including 2cycle, but is specifically designed for use in higher end vehicles and equipment, such as classic/hot rod type vehicles, motorcycles, and ATV’s. For Marine engines, we recommend the use of STA-BIL® 360° MARINE. WHERE CAN I PURCHASE STA-BIL 360° PROTECTION™? Please refer to our Where to Buy tab on this site for more information on retailers carrying STA-BIL 360° PROTECTION™. You can also call us toll free (800-367-3245) for more information. STA-BIL 360°® Protection™ is rated 4.8 out of 5 by 67. 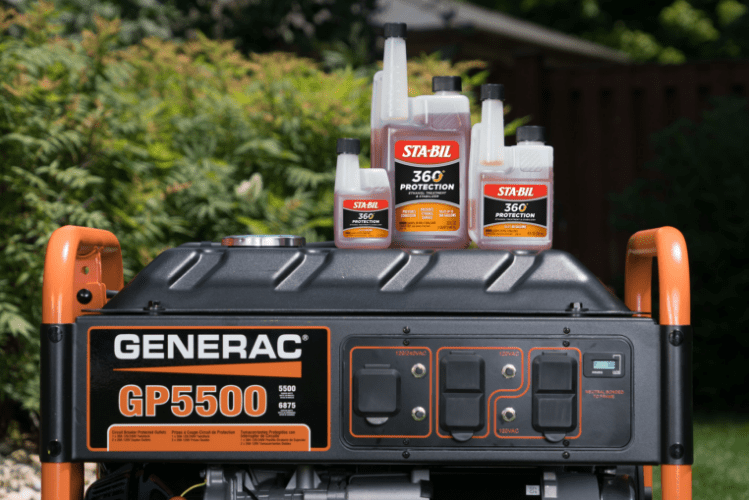 Rated 5 out of 5 by Mark 1 from Relialble product I have used Sta-bil 360 not only in my boat but also in my back up generator, pressure washer, chain saw and other equipment that sits for an extended period of time. I have never had any issues with my gas even after a period of 6+ months. This product is very reliable and will save you money from costly repairs due to stale bad gas. Rated 5 out of 5 by krjohn from Perfect for my needs One of the uses will be for my antique tractor, which may run once or twice a month. Will help protect the fuel sysem. Rated 5 out of 5 by Gary11 from Stablize your fuel I have used this product for a long time. Glad to provide feedback on a product that will keep your fuel system in good working order. 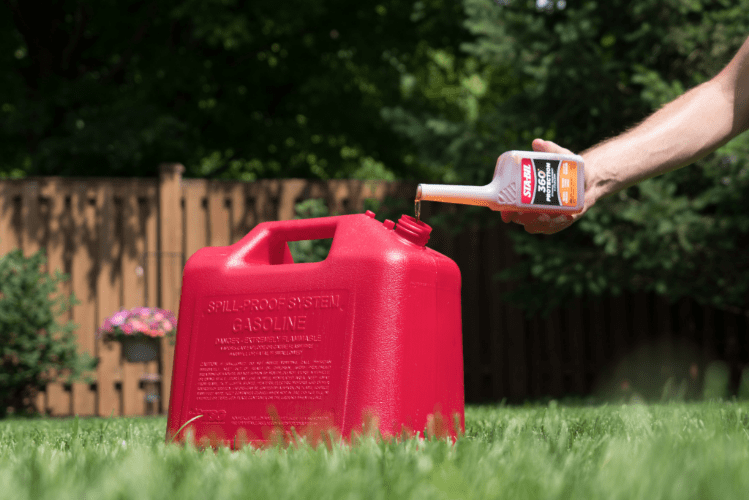 It allows you to leave fuel in lawnmowers , cars, and other engines without worrying about hurting the fuel system. It keeps gasoline fresh. It is a must for anyone who wants to keep engines running like new. Rated 5 out of 5 by Justa6 from Hard to gauge Most users don't understand what ethanol does to a fuel system. Corrosion is not something you can see with out tearing into the system. By the time your having problems...it's too late. I used the product last year and basicly trusting the Sta-bil reputation for Gold Eagle products you have no idea if they are working or not. Rated 1 out of 5 by jimkatg from Stabil not effective with modern small engines I have been using Stabil products for years and never had any problems with fuel storage or use. However, I bought a Snapper SP80 Lawnmower last year and used the mower with fresh fuel and Stabil 360 in the fresh fuel. After letting the mower sit for 3 months with the fuel and Stabil 360, the mower would not stay running. I changed the fuel, replaced the spark plug and air filter - mower would still not stay running. Took mower to authorized Snapper repair center and was told that carburetor needed rebuilding due to "bad" fuel. None of my other gas operated tools (older) have any problems so I have to assume that the newer gas engines are not protected by Stabil. Snapper told me it was probably the ethanol that caused the problem. Either way, the Stabil did not perform as expected and now I will have to look for alternate fuel stabilizers. Rated 5 out of 5 by Green Grabber from Love 360! 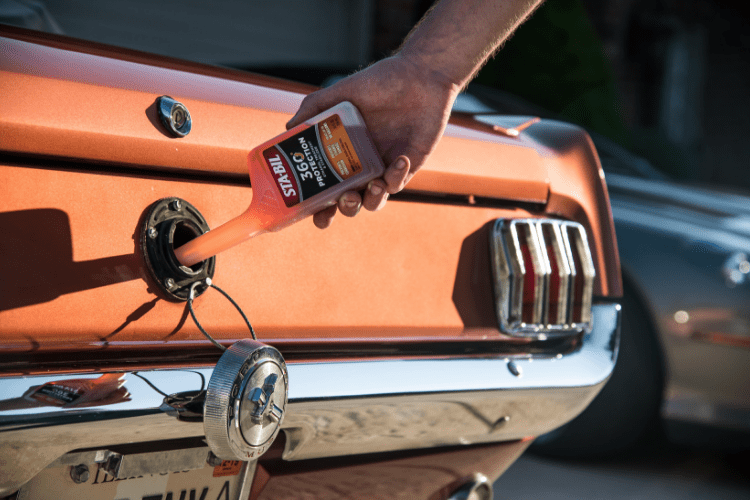 Use the Sta-bil 360 in my 1972 Ford Maverick, fuel tanks are hard to find for my car so I love the added protection 360 provides! Rated 5 out of 5 by Pacecar68 from Great throttle responce; hot restarts are much bet I have 2 vintage autos. I tried Sta-Bil 360 in my 1968 Ford Torino Indy Pace Car and my 1966 Dodge Coronet 500. Both cars have big block motors. After treating both cars with Sta-Bil 360; I could tell a improvement in the first 50 miles. Both cars had a sluggish throttle responce and both now accelerate very smoothly. The Dodge has given me problems on hot restarts; it starts much easier since the treatment. I would reccomend using this product on your vintage auto. Rated 5 out of 5 by Guy1 from Sta-Bil 360 peace of mind I heard a lot about the effects that ethanol can have on your engine. I have always been a service minded person who always gets a lot of years of service out of any type of engine. Sta-bil gives you peace of mind just knowing you wont have that water separation from using ethanol that can rust your equipment from the inside out. It also helps keep injectors clean. By using this product it will save you money in the long run. Rated 5 out of 5 by g90g00 from Great for our lousy ethanol gas!!! 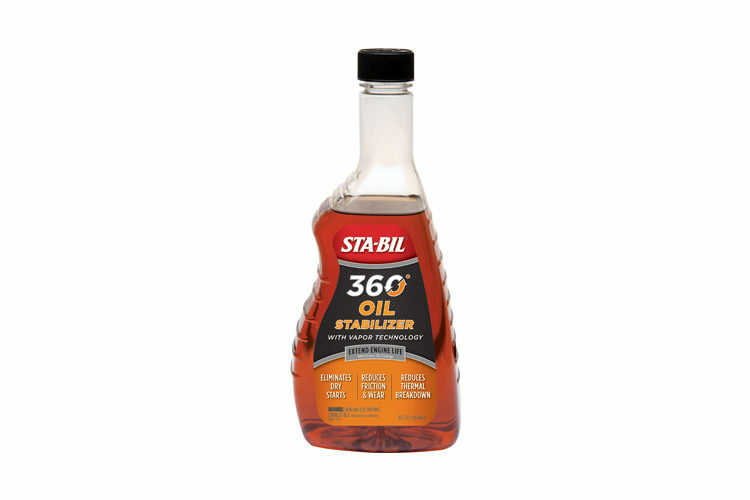 With the very poor performance of the ethanol gas that we get these days, I use Sta-Bil 360 Performance in all of my small engines as well as in my collection of muscle cars. Most of these aren't run on a regular basis, but when I do, they all fire right up and run perfectly. I highly recommend this product for ALL engines!! What more can you say.... it's Sta-Bil and they wrote the book on gasoline enhancement. Rated 5 out of 5 by mkurtenbach from Review of Sta-Bil 360 Received a sample of this product. Have used in a couple of riding mowers and one chainsaw. So far have no starting issues with any of them. This product is doing exactly as described and works perfectly. Also like the design of the bottle, I am able to add as much or little as I need to add. The real test will happen over a long northern WI winter. But, have to wait a few months for that happen. Rated 5 out of 5 by Captain Rick from Great Protection I have been using the regular red Sta-Bil for many years with excellent results. Decided to try this 360 because I ran into a problem with my mini bike and portable generator. Both are made in "C" and the steel fuel tanks are both rusting inside and fouling the carbs. I removed the tanks and soaked in EvapoRust for 3 days, so now they are nice and clean. Judging by my past experience with the regular version, I'm very confident this product will perform as advertised. I can't imagine a company with this good a reputation would risk selling a product that didn't work. Of course, only time will tell, so if it doesn't work to stop the rust, I will certainly modify this review. I also noticed that the 360 now treats 5 gallons per ounce compared to 2.5 gallons for the regular red version. After checking. I think (not positive) they have increased the red to 5 gallon treatment also - no re-formulation, just testing and studies have shown it's effective at that dose. Anyway the generator and mini bike are loaded up with 360 and running fine. Will check the tanks in 3 months and verify the results. Rated 5 out of 5 by BanditTA from Ethanol Fighting Power! 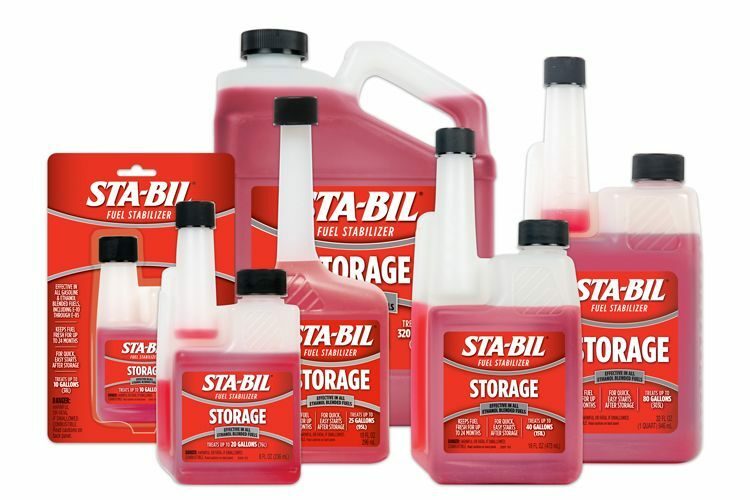 After doing some research into the damage ethanol causes older cars, I only use Sta-Bil Protection in my vehicles now. I add it with every fill up for maximum corrosion protection. My cars are 38 and 25 years old and they just were not designed to handle the amount of Ethanol in today's fuels. I have no issues now with fuel lines or anything else. Best insurance money can buy! Rated 5 out of 5 by Darrell H from Sta-Bil vs. Ethanol Been using Sta-Bil for several years to keep the small engines running. It has eliminated the problems associated with the added ethanol that is so hard to avoid today. I was pleased to see and try the 360 version with the added protection above the fuel in the tank. Keeping a tank full is a best bet for keeping out condensation and this is an added layer of protection. Rated 5 out of 5 by Lou1 from Great for stored cars! This works great in my '72 Buick GS. I doesn't get used much, even in the summer. 360 performance keeps the fuel system ready to go when I get the urge to drive it or take it to a cruise in. No more starting problems or running issues due to fuel. I am gald I found this product. I plan to use this when I store my summer equipment also this winter. Rated 5 out of 5 by Chuck L from Better Small Engin Performance I have used this for several weeks now in my lawn mower, gas blower and gas trimmer, and found it helps it start on the first pull. 2 cycle engines seem to blow less oil smoke. I live in Chicago so I will not have to worry about the gas storage over winter with this added. Great product will continue to use for all my small engines. Rated 5 out of 5 by NEDiver from So Far So Good I've been using STA-BIL products for years with great results. I use this stabilizer in outdoor equipment that is stored in a portable shelter that is subject to extreme temperature changes. Only time will tell if the vapor technology does what it supposed to, but so far the tanks on my roto-tiller and wood splitter look good. Rated 5 out of 5 by TexasTurboT from STA-BIL 360, Saves you $$$$$ on repair bills! I have been using Sta-bil in all my gas powered engines for years. Have never had any issue with moisture in the tanks in the spring after sitting all winter long. They start right up as they should! Sta-bil is small investment to make sure my equipment is going to be ready when it's needed! Rated 5 out of 5 by cleo from BTTER THEN EXPECTED I waited a few weeks before reviewing this product to make sure it worked - WOW -Its better then expected -engine is running much smoother and I would highly recommend this -I also used a little in my lawn mower and that engine ran better ... I bet it would work on boats too. Rated 5 out of 5 by Moretolife from Engine started after sitting all winter! While I can't see inside the engine, the fact that I didn't have to make a trip to the equipment dealer for a carburetor rebuild tells me it must be working. Ethanol has really created a problem for us small equipment owners. Sta-bil 360 is helping us fight back. Rated 5 out of 5 by Polish don from Works great. I've used other Sta-Bil products in the past and have been very pleased. So I tried this product in my classic car when I was going to leave it parked for a few weeks. It works as advertised. Will definitely purchase again when I put her away for the winter. Rated 5 out of 5 by jptrucker1 from Results were immediate I added Sta-bil 360 performance to the fuel tank of my TR7 before a road rally through the hills of Central NY. We ran from lake to lake. A noticeable improvement in a lean condition that was occurring on long uphill climbs. The car ran great all day. Rated 5 out of 5 by Shocker from I haved used Stabil and now Stabil 360 in my seasonal equipment such as riding mowers for years but have recently started using it in my old muscle car and it keeps it from dieseling. Very good product.